Sunday’s Global Citizen Festival, attended by tens of thousands of people at Johannesburg’s FNB Stadium, was memorable for both good and bad reasons: spectacular performances from local and international artists were followed by a breakdown of security and logistics after the show. But what was intended to be a charity event also had an intriguing political dimension which bears further examination. Roughly six hours into the Global Citizen Festival, something unexpected happened. On stage appeared Patrice Motsepe, the billionaire patron of his eponymous foundation. Since the Motsepe Foundation appeared to be picking up at least some of the tab for the event – its branding was splashed around the stadium – Motsepe received a warm welcome from the crowd. Motsepe proceeded to call up on stage the following cast of characters: the “King of the Zulu nation”, religious leaders from the Zion Christian Church and the NG Kerk, Cosatu president Zingiswa Losi, and representatives from both white and black South African farmers’ organisations. Each was given roughly 20 seconds’ microphone time to express general sentiments of goodwill. To this end, he said, the Motsepe Foundation was committing R3.5-billion to the cause of land reform. The audience clapped enthusiastically, though at this point a certain degree of donation fatigue appeared to have settled. Since 14:00, every hour at the festival had seen a new announcement hailing a new astronomical sum of money being donated by either corporates or governments to address African challenges. Shortly afterwards, Beyoncé and Jay-Z would take the stage to perform a dazzling, unforgettable set. 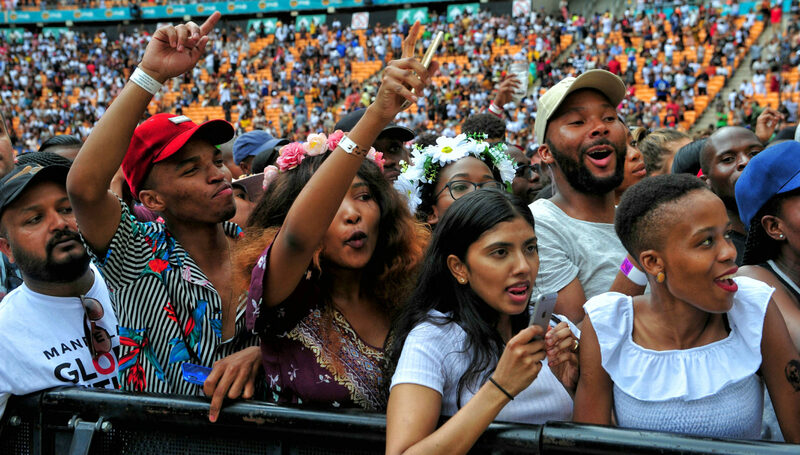 Thereafter, festivalgoers leaving the FNB Stadium would be subjected to conditions of chaos affecting transport arrangements that would leave a good number as the victims of crime. All in all, it’s fair to say that Motsepe’s announcement was probably top of nobody’s mind on Monday morning. Yet it’s worth dwelling on for a moment, for what it suggests about the curious interplay of government, the private sector and philanthropists in South Africa. Consider the characters that Motsepe brought on stage to represent the multisectoral nature of his land reform intervention. Churchmen; Zulu royalty; a representative of South African workers, and two people standing in for white and black farmers. Notably absent: politicians. Or anyone representing the South African government. The tone of the day was indeed determinedly apolitical, but to discuss a key piece of government policy without involving government is surely a conscious choice. Earlier in the day, when the US government had committed a staggering $16-billion to HIV treatment in South Africa over two years*, Health Minister Aaron Motsoaledi had appeared on stage to acknowledge the largesse and pledge government support. For Motsepe’s land announcement, by contrast, no Minister of Rural Development and Land Reform was on hand to acknowledge the “partnership”. It’s not clear what the Motsepe Foundation intends to do with the R3.5-billion it is putting towards land reform; its website is currently silent on the matter. It’s fair to assume, however, that funds of that magnitude are intended either to buy and distribute land, or to give financial support to emerging farmers, or some combination of the two. Many South Africans will doubtless welcome Motsepe’s intervention, whatever form it takes. Indeed, Patrice Motsepe is currently enjoying a moment of popularity in South Africa. Though his philanthropy is nothing new, this weekend saw many expressions of gratitude on social media for the fact that Motsepe is seen to be almost single-handedly responsible for bringing four enormously popular cultural figures to the country this year: footballer Lionel Messi, former US president Barack Obama, and Beyoncé and Jay-Z. In this way, Motsepe has cemented his reputation as South Africa’s unofficial Minister of Fun, or perhaps a national Fairy Godfather of sorts. But the intervention into the land issue is a different kettle of fish. The other causes tackled by the Global Citizen Project were unambiguous staples of global development: health, education, gender equality, and so on. Land reform in South Africa currently is different. While it’s possible to make a compelling case for the argument that land reform is an inextricable aspect of economic justice for South Africa, there’s no denying the fact that it is a hot-button issue over which the ruling party has revealed itself to be somewhat conflicted and dithering in tackling. Johannesburg’s iteration of the Global Citizen Festival was broadcast internationally, and Motsepe may have seized the opportunity of a moment of global attention to try to transmit the message to international investors – via his multiracial stage cast – that South Africa is bent on dealing with the issue in a manner that will not damage the country’s precarious social cohesion. But that is a message which is surely the responsibility of government to transmit, rather than a private citizen – however well-connected he may be politically. Motsepe’s actions on Sunday will fuel rumours that the billionaire harbours aspirations of a future presidential run, however scant the other evidence to support such a notion. If his intentions are purely philanthropic, however, it raises questions about the current administration’s idea of “public-private partnerships”, a concept which President Ramaphosa’s government has been eagerly pushing. When President Ramaphosa appeared on stage on Sunday – after an introduction by Oprah Winfrey which established his credentials in the eyes of the world by stressing that Ramaphosa had been Nelson Mandela’s chosen successor – he had the air of an inessential bit player on a day which had seen massive sums pledged to aid South Africa’s development. As mentioned, the amounts of money promised to South Africa in commitments from foreign governments and big corporates were eye-watering. From Vodacom: almost R500-million to fight gender-based violence, improve sanitation in schools and enhance digital literacy. From Procter & Gamble: around R410-million over three years to support women-owned businesses. From the US government, via the United States President’s Emergency Plan for Aids Relief (PEPFAR): R16-billion over two years to fund HIV treatment. From the Global Fund: almost R5,3-billion over three years towards HIV prevention. Those are just a few examples of the millions that will be flowing to South African coffers in the near future to support basic development targets. Most of the money will be spent on funding things that should be part of the government’s essential mandate: ensuring that kids don’t die in pit latrines in schools, for instance, and ensuring that people living with Aids have access to the drugs they need. And while ordinary South Africans may be grateful for the injection of these external funds, if it results in a higher quality of basic services, it’s worth remembering that money itself has never been South Africa’s greatest challenge. Indeed, most state spending already goes on health and education, with a report in 2017 finding that South Africa spends a higher proportion of its budget on education than the US, the UK and Germany. It does so with poorer educational results than a country like Kenya, which spends about 7% less. Those who have followed the virtual collapse of the Limpopo health system as a result of corruption and mismanagement, meanwhile, may shiver to consider the potential misuse of the new billions flowing in to fund Aids treatment. Even if all the money goes to the causes for which it is intended, however, it is still a stark indictment of South African governance that the fulfilling of its citizens’ most basic needs should be effectively outsourced to foreign governments and transnational mega-corporations – the latter not known for condition-free benevolence – 24 years after democracy.